guruparamparai – AzhwArs/AchAryas Portal | Consolidated view of srIvaishNava guruparamparai – Glorious life history of AzhwArs/AchAryas in multiple languages. Part of http://koyil.org initiative. I worship the glorious guru paramparai which starts with sriman nArAyaNan, has nAthamunigaL and yAmunAchAryar in the middle and ends with my Acharya. This divine slOkam was rendered by kUraththAzhwAn (kUrEsa) to glorify our guru paramparai. According to him, asmadhAchArya means emperumAnAr because emperumAnAr was his AchArya. But in general, asmadhAchArya will mean the AchArya of the reciter of this slOkam. Our dharsanam is called “emperumAnAr dharisanam” by namperumAL as maNavALa mAmunigaL identifies in upadhEsa raththina mAlai. 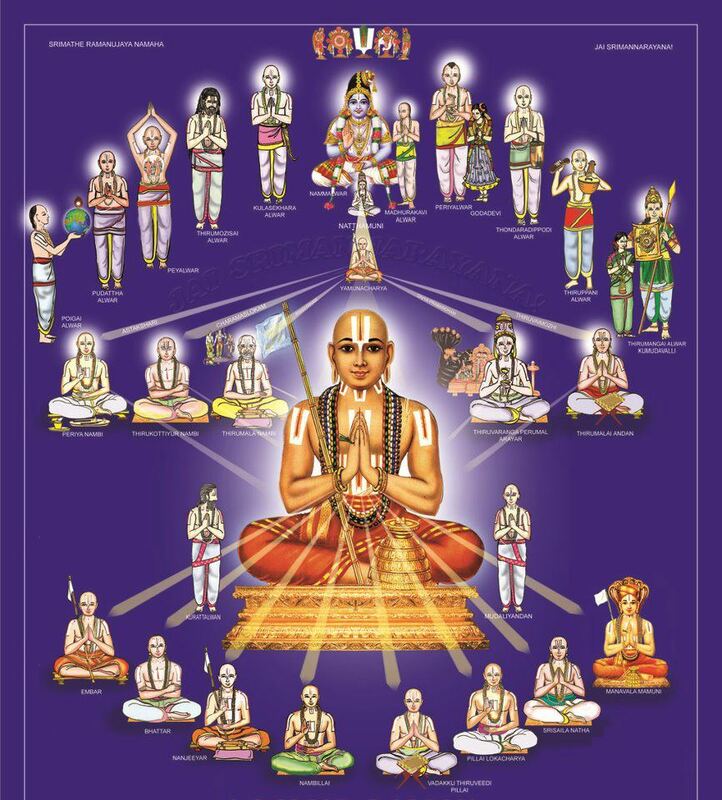 It was srI rAmAnuja who re-established the sanAthana dharmam (eternal way of life) during his life time. He took the message from his predecessors nAthamunigaL, ALavandhAr, etc and presented it to everyone in a very simple manner. guru and AchArya are synonyms. guru means one who clears the ignorance. AchArya means one who has learnt sAsthram, follows it himself and also makes others follow the same. Guru paramparai means unbroken lineage of AchAryas. Our srivaishnava guru paramparai starts with none other than sriman nArAyaNan himself as we see in this lakshminAtha samArambhAm slOkam. It is out of the unbounded mercy of sriman nArAyaNan, he himself takes up the responsibility of clearing the ignorance in the minds of samsAris (jIvAthmAs who are bound in this material world) to rescue them and give them the ever lasting blissful life in paramapadham. So he became the first AchArya in our guru paramparai and taught the valuable meanings in sAsthram. “thaththva jnAnan mOksha lAbha:” declares sAsthram. By acquiring real knowledge we get liberated. All the real knowledge we have now, has been received through this unbroken chain of spiritual teachers. So, it is very appropriate to know more about our AchAryas and discuss about their lives and instructions all the time. emperumAn srIman nArAyaNan who is sriya:pathi (husband of sri mahAlakshmi), one who lives eternally in srIvaikuNtam with his dhivya mahishis (divine consorts – sri, bhoo, nILA dhEvis) where he is served by nithyasUris like ananthan, garudan, vishwaksEnar, etc is full of auspicious qualities. 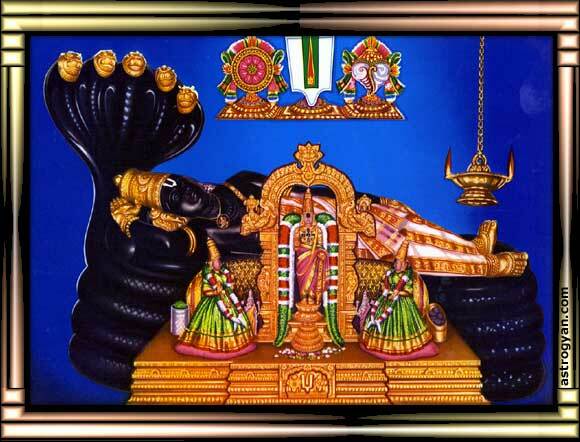 srIvaikuNtam (paramapadham) is a place of eternal bliss, but when emperumAn is enjoying there, his heart is with the jIvAthmAs in samsAram (since they are suffering there). All jIvAthmAs, a) nithya – always in paramapadham (never been to samsAram due to karma), b) muktha – one who was in samsAram but liberated now and c) badhdha – one who is in samsAram bound by karma are all subservient to emperumAn and have the same relationship with emperumAn (owner – owned and father – son relationships primarily). It is out of this relationship alone emperumAn is helping all badhdha jIvAthmAs constantly to bring them to srIvaikuNtam and engage them in eternal kainkaryam. emperumAn took the form of nArAyaNa rishi (AchArya) in badhrikAshramam and revealed thirumanthram to his own avathAram nara rishi (sishya). emperumAn revealed dhvaya mahA manthram to periya pirAtti (sri dhEvi nAchiar) in vishNu lOkam (thus starting our srIvaishNava guruparamparai). emperumAn, as pArtha sArathy (krishNa), revealed charama slOkam to arjuna in the battle field of kurukshEthram. This is a humble effort from us to discuss our glorious guru paramparai as explained in 6000padi guru paramparA prabhAvam (written by pinbazhAgiya perumAL jeeyar) and yathIndhra pravaNa prabhAvam (written by piLLai lOkam jeeyar) and other pUrvAchArya granthams. For easy reading, we have created 4 sections/categories. Wonderful. A very good attempt. Every Srivaishnavan should read this. Very nice. Greetings and best wishes. Your hard work over the years would certainly bring in the desired results. Adiyen Ramanuja Dasan. present activities and lad for further similar efforts. A superb compilation. My compliments on making the Sri Suktis of our Tenkalai Sampradayam available to all. Namaskarangal , Very good work, Each and every information is very useful , Every vaishnavas should read and know all the fundamental information.